After a day of sightseeing on the northern and eastern side of the Big Island, my husband, myself and my in-laws were finally in need of some sustenance. Having forgone lunch in lieu of a scoop of ice cream and a couple of smoothies on the scenic highway leading into Hilo, and having driven many miles over Saddle Road to get back to Kona, we needed a nice, relaxing setting where we could just kick back, relax and grub on some good food. My husband and I knew just the place to take his parents. It was a restaurant that we visited last year when we were on the Big Island and we had both enjoyed. And it was food that was sure to be just up my in-law’s alley. The Kona Brewing Company with their amazing pizzas and of course, their signature beers, is the perfect ending to a long day of sightseeing. I knew that my husband and my father-in-law would appreciate the beer, and what goes better with beer than pizza? It’s a winning combination and a little reminder of home, while traveling to a far off place. As the life long dream of a local father and son team who wanted to bring the spirit of Hawaii and bottle it up in craft brewed beer, they produced their first bottles and kegs in 1995. After finding success with their creations, they opened their flagship brewery and pub in Kailua-Kona. The success of Kona Brewing Company beer has gained the company worldwide recognition for the quality and taste of their brews. 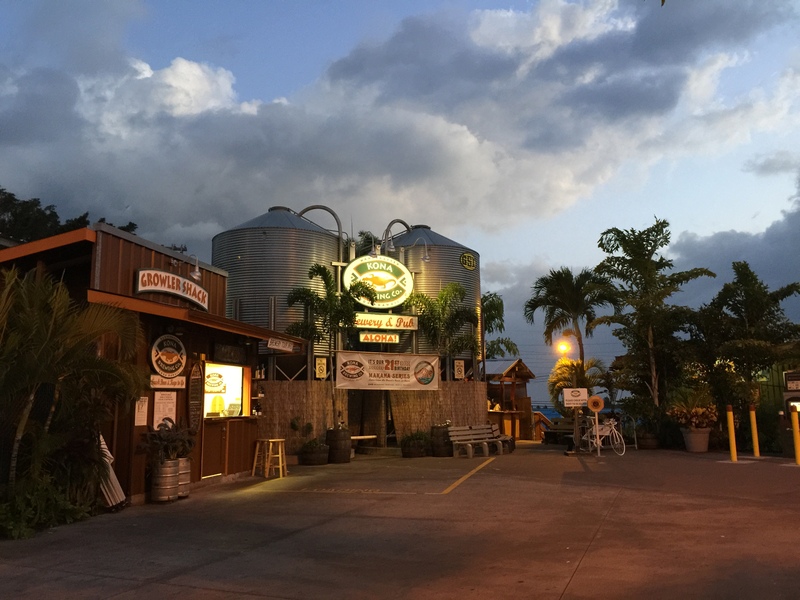 When you visit the Kailua-Kona location, you can take a brewery tour to see how their famous beer is brewed and take home some growlers with you. 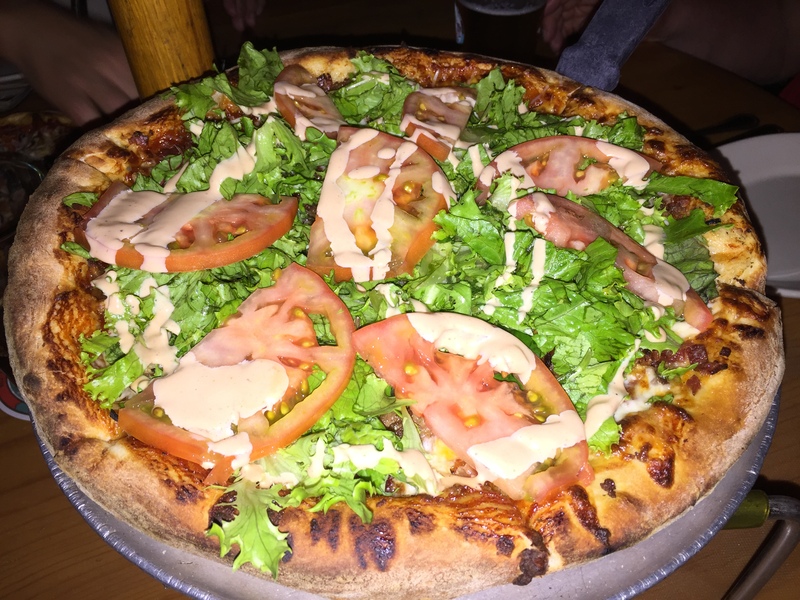 Or you can come to the pub, enjoy a pint with friends along with the wonderful, complimentary selections of pizza, sandwiches and other favorites. My husband wasn’t about to dine at the Kona Brewing Company without having a pint of one of local brews. Black Sand Porter was his beer of choice. 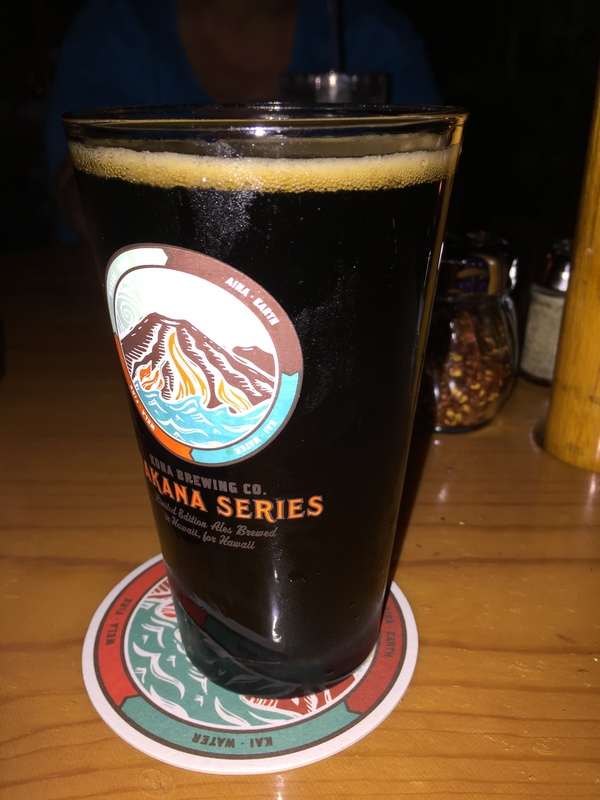 He had tried the Black Sand Porter last year when we visited the Kona Brewing Company and had really enjoyed its flavor then, so he figured, why mess with a good thing. We can find some KBC’s other favorites here locally, such as the Big Wave Golden Ale, and the Fire Rock Pale Ale, but the Black Sand Porter is something we’ve not seen locally. Therefore, you might as well enjoy it while your on the islands.. Described as smooth and dark with strong roasted and chocolate malt flavor and aroma, the full malt flavor of the Black Sand Porter is complemented by Kona Brewing Company’s distinctive blend of hops. My husband definitely said that he could taste the subtle flavor of the chocolate in the beer and it actually added such a nice rich quality to the beer. I chose gingerade for my drink. 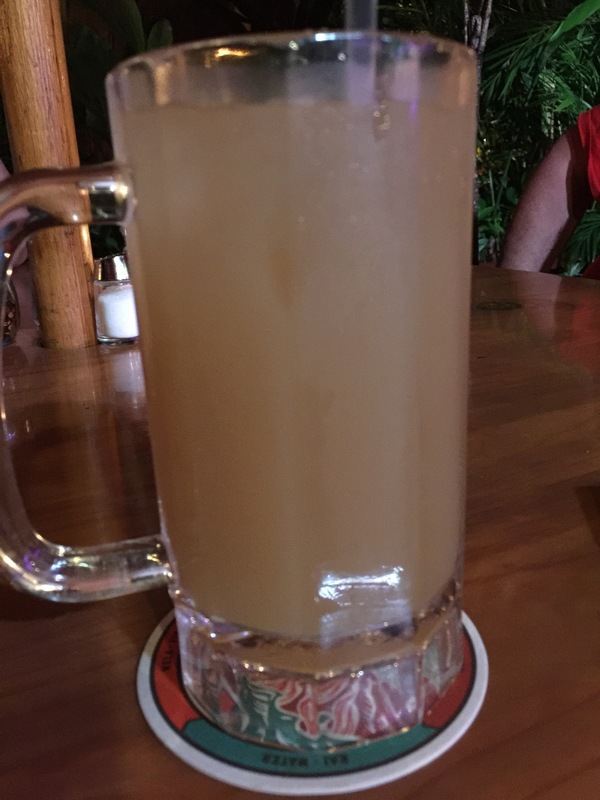 The menu described it as Big Island ginger mixed with organic lemon juice to make a powerful and delicious beverage. The waitress told me that while she loved the drink, it was quite strong and potent. So she said that she would bring me a small sample of the gingerade so that I could taste it first and if it was ok, then she’d bring me the whole drink. One little sip of the small sample the waitress brought me and I could see right away why some people might not enjoy this drink. The gingerade is definitely powerful and strong. Heavily flavored with pungent and potent fresh ginger, the drink clears your sinuses and really hits your tastebuds. If you are not a fan of ginger, this drink isn’t for you. Luckily, I love ginger and I really enjoyed the power this drink packed. I definitely wanted a full glass of it. The lemon juice tames the potency of the ginger somewhat and adds an acidic tang to the drink, but realistically, this drink is almost like drinking straight up ginger juice. It was incredibly refreshing and palate cleansing and a completely unique combination of flavors I’m not sure I’ve ever experienced. 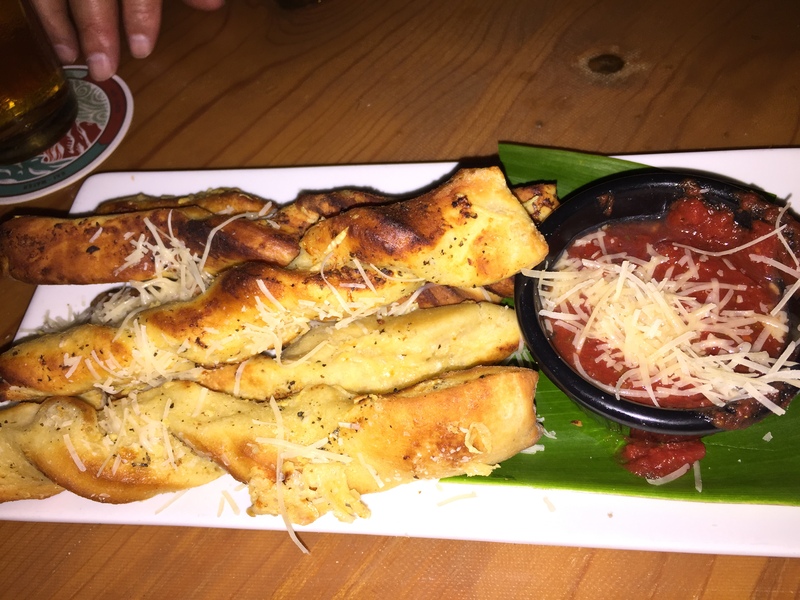 While we waited for our pizzas to bake in the pizza oven, we started our meal with an order of garlic twists. The twists are actually made from spent-grain, baked and then seasoned with herbs, garlic and parmesan. They are served hot to the table with a side of marinara. The twists are light and airy with a great crunch to them. Depth in a little marinara sauce and they are a great appetizer. Even though we ordered these twists as well last time my husband and I were at the Kona Brewing Company, what I didn’t realize is that theses twists were made from spent-grain. Since this is a craft brewing company, and since one of the ideals behind the creation of the company is to “protect the pristine environment,” the restaurant tries to use what it already has available at its disposal, spent-grain. Spent-grain is the left over malt and adjuncts produced at a brewery after creating their brews. This spent-grain can account for as much as 85% of the total byproduct of a brewery and since it’s full of nutrients and flavor through the brewing process, it would seem a shame to waste all of it by throwing it out. Through a process of drying out the grain and running it through a grain mill you can create spent-grain flour which works wonderfully well in bread products and gives second life to the waste from your brewing process. With 4 of us dining, and some of us with different taste than others, we decided to order three different pizzas. 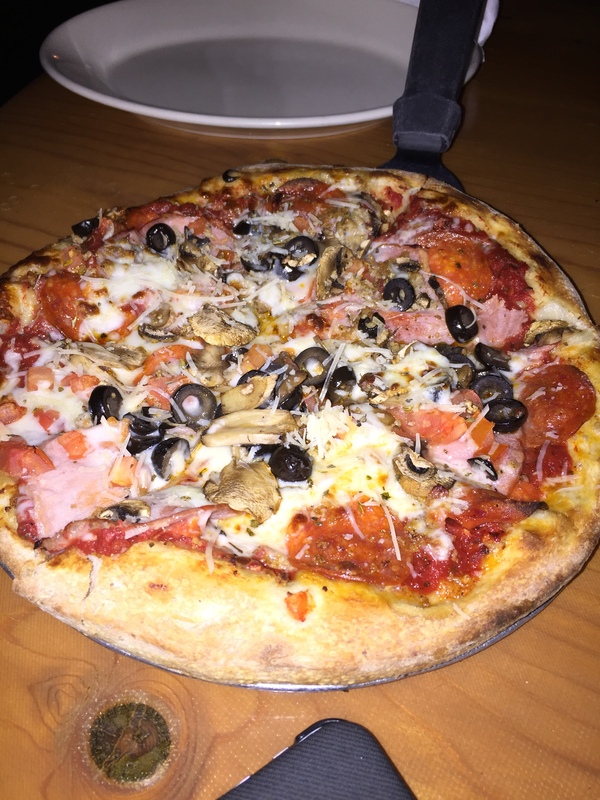 Like all of the bread products on the pupus (appetizer) menu, all of the pizzas at Kona Brewing Company are also made using their spent-grain flour in their pizza dough recipe. It’s just another way to make try to limit the amount of waste product created at the brewery by repurposing it to create amazing food at the restaurant. My mother-in-law decided to order the Captain Cook pizza made with tomato sauce, mozzarella, parmesan sausage, Canadian bacon, pepperoni, tomatoes, mushrooms and black olives. Seeing as no one else in the family likes black olives, my mother-in-law was on her own in chowing down on this particular pizza. My husband thought everything on the pizza sounded great until he got to the black olives, and since there were so many more than he wanted to bother trying to pick off, he decided not to help his mom with any of her pizza. However, she did a pretty good job on her own with the pizza and almost finished the whole thing off. She said she really enjoyed the pizza and thought it tasted wonderfully. I guess I’ll take her word on that. We ordered a large Kulana bacon cheeseburger pizza for myself, my husband and my father-in-law to share. My father-in-law, who’s a bit more of a traditionalist when it comes to pizza, at first wasn’t sure about the idea of bacon cheeseburger toppings on his pizza. Made with bbq sauce, whole milk mozzarella, Big Island ground beef, Maui onions, chopped bacon and cheddar cheese, the pizza is then topped with shredded lettuce, diced tomatoes and KBC “special sauce.” I think my father-in-law was quite surprised by how much he actually enjoyed the pizza. It was really good and tasted just like a bacon cheeseburger. The ground beef with the sweet Maui onions was terrific, and the special KBC sauce really brought the whole pizza and hamburger concept together. The only item on the pizza that wasn’t locally grown was the big slices of beefsteak tomato as our waitress told us that the Big Island has trouble keeping up with the demand for large tomatoes and can’t grow enough on the island, so they need to import the beefsteaks from the Mainland. Otherwise, everything else on the pizza is locally grown and sourced from the islands. The pizza is fantastic, and incredibly tasty, and was completely finished by the three of us in no time. The final pizza we ordered was the Kohala. We ordered a medium pizza for just myself and my husband to share since neither of his parents were interested in this pizza. Made with a garlic infused olive oil base, topped mozzarella, gorgonzola, roasted red peppers, fresh spinach, fresh garlic, parmesan sausage and macadamia nuts, this pizza was really tasty. What I loved was the sharp bite and tang of gorgonzola that was sprinkled throughout the pizza, and yet it wasn’t overpowering at all. The crunch of the macadamia nuts and the freshness of the spinach all made for a very flavorful and well rounded pizza. My husband really loved this pizza with all of the different flavors and textures combined into one tasty pizza. Even though I agreed to order the pizza to split with my husband, I was a bit skeptical about it, especially containing the roasted red peppers. 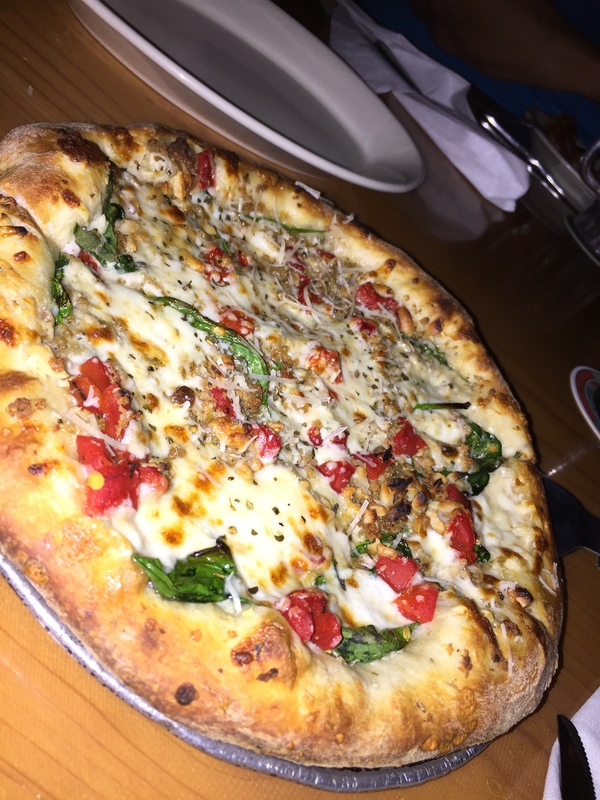 But, like my husband, I really did enjoy all of the different flavors that all came together so beautifully in this pizza from the macadamia nuts to the fresh spinach and the tangy gorgonzola. My in-laws and my husband and I all walked out of Kona Brewing Company after dinner that night full and happy. We all agreed that the pizza was terrific and filling. My father-in-law liked the bacon cheeseburger pizza much more than he thought that he would. A good comfort food meal of pizza and beer, what more could you ask for? Dining outside on the patio, feeling the ocean breeze. It’s like being in paradise. Oh wait, we are in paradise.